Human SIRP alpha, His Tag (HPLC-verified) (SIA-H5225) is expressed from human 293 cells (HEK293). It contains AA Glu 31 - Arg 370 (Accession # NP_001035111). The protein has a calculated MW of 38.1 kDa. The protein migrates as 47-55 kDa under reducing (R) condition (SDS-PAGE) due to glycosylation. 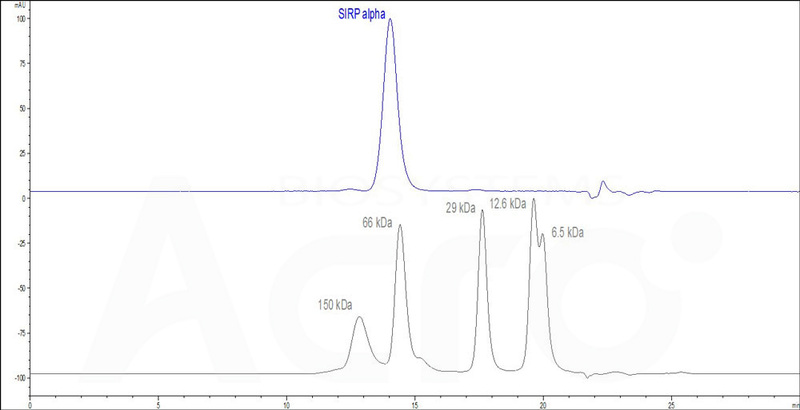 Human SIRP alpha, His Tag (HPLC-verified) on SDS-PAGE under reducing (R) condition. The gel was stained overnight with Coomassie Blue. The purity of the protein is greater than 95%. The purity of Human SIRP alpha, His Tag (HPLC-verified) (Cat. No. SIA-H5225) was greater than 95% as determined by SEC-HPLC. Immobilized Human CD47, Fc Tag (Cat. No. 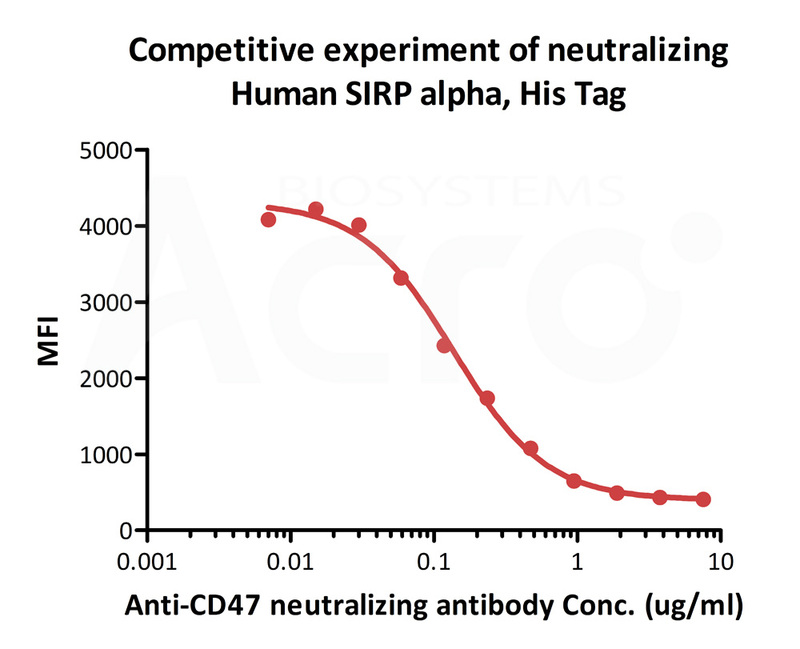 CD7-H5256) at 2 µg/mL (100 µl/well) can bind Human SIRP alpha, His Tag (Cat. No. SIA-H5225) with a linear range of 16-250 ng/mL (QC tested). 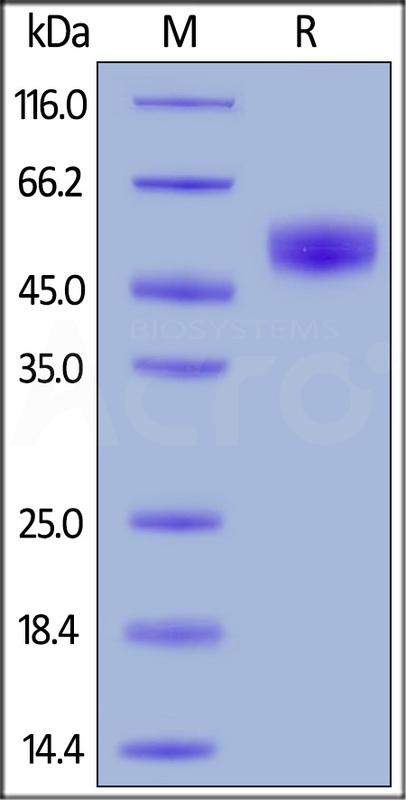 FACS assay shows that recombinant Human SIRP alpha, His Tag (HPLC-verified) (Cat. No. SIA-H5225) can bind to Jurkat cell expressing CD47. The concentration of SIRP alpha used is 1 μg/ml (Routinely tested). 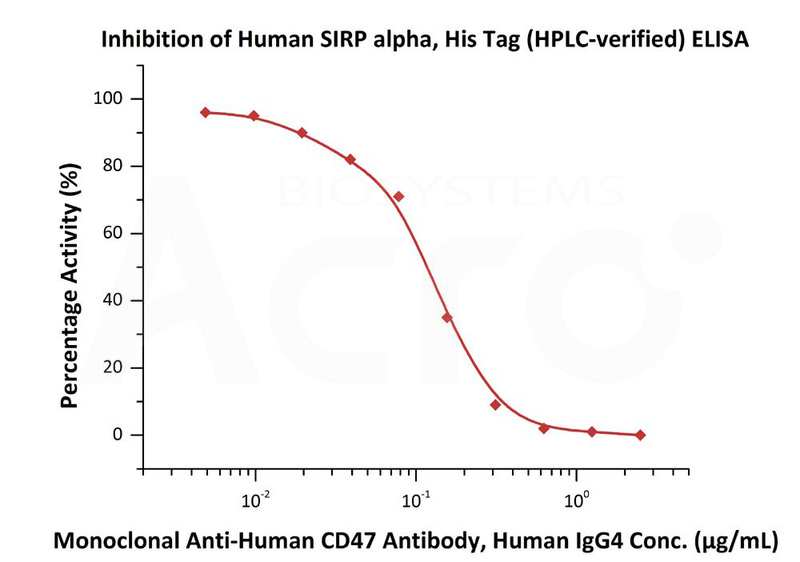 FACS analysis shows that the binding of Human SIRP alpha, His Tag (HPLC-verified) (Cat. No. 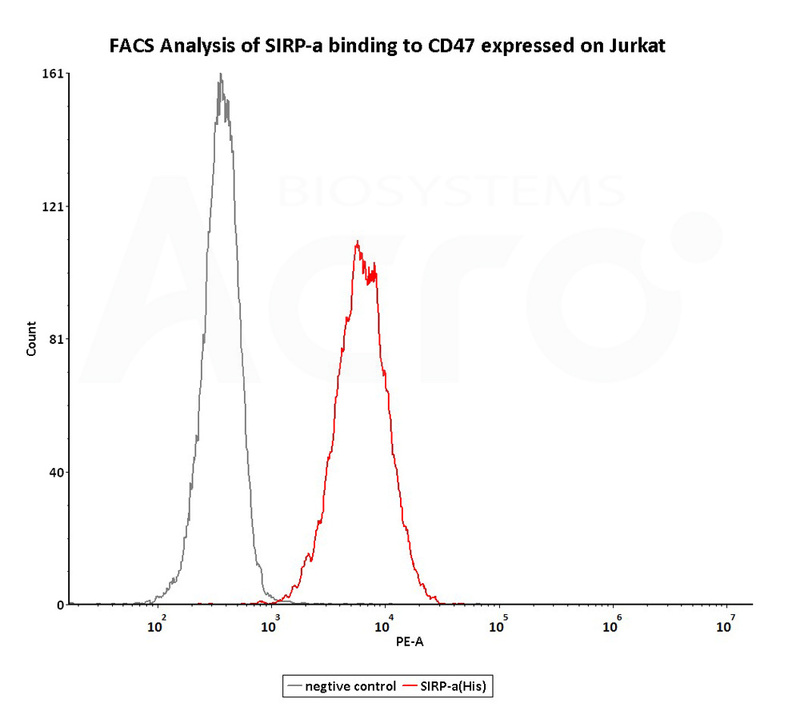 SIA-H5225) to Jurkat expressing CD47 was inhibited by increasing concentration of neutralizing anti-CD47 antibody. The concentration of SIRP alpha used is 1 μg/ml. IC50=0.2257 μg/ml (Routinely tested).